Norwegian today reported its full year and fourth quarter 2017 results. The net loss was -299 million NOK (-£27.4 million) in 2017, while the earnings before interest, taxes and depreciation (EBITDA) was 60 million NOK (£5.5 million). Significant costs related to increased fuel prices, wet lease and passenger care affect the results. Going into 2018, Norwegian is far better positioned with stronger bookings and a better staffing situation. Major investments have also been done in 2017 to prepare for future growth. The company’s total revenue was almost 31 billion NOK (£2.8 billion) - an increase of 19 percent compared to 2016. A total of 32 brand new aircraft entered the fleet, contributing to a production growth (ASK) of 25 percent. The load factor was unchanged at 88 percent. A total of more than 33 million passengers chose to travel with Norwegian in 2017, an increase of 13 percent compared to previous year. For the fourth quarter, the net loss was 919 million NOK. The total revenue was more than 7.8 billion NOK, an increase of 30 percent from the same period last year, primarily driven by international growth as well as an increased traffic in the Nordics. Just over 8 million passengers flew with Norwegian this quarter, a growth of 12 percent. The load factor was 85.3 percent. 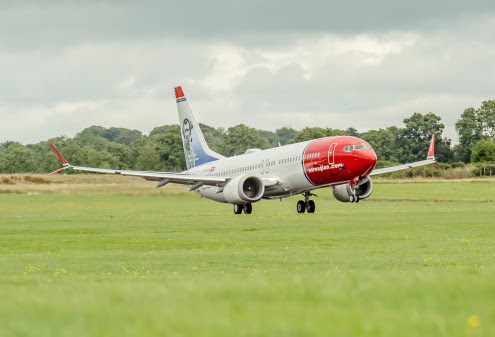 Norwegian made major investments in the fourth quarter related to training of pilots and cabin crew on both its wide-body and narrow-body fleet to prepare for the growth in 2018. “We are not at all satisfied with the 2017 results. However, the year was also characterized by global expansion driven by new routes, high load factors and continued fleet renewal. Through our global strategy, we contribute to local economic boost and increased employment at our destinations, as well as ensuring that more people can afford to fly - not least between the continents. In 2017, we received several major international customer awards, which would never have been possible without our dedicated colleagues at Norwegian,” said CEO Bjørn Kjos of Norwegian.